Yay! Tim Hortons Roll Up The Rim is back! There are millions of ways to roll and win this year! 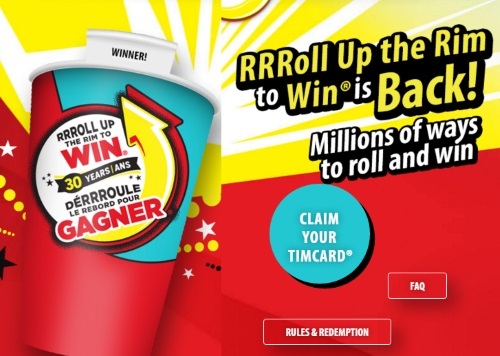 Grab a Tim Hortons RRRoll up cup in-restaurant and RRRoll for your chance to win! There are millions of prizes to be won like the all new Honda 2016 Civic! Game ends April 17, 2016 or while contest cup supplies last whichever occurs first. All prizes must be redeemed by May 8, 2016. For no purchase entry, send a postage paid, self-addressed stamped envelope to Tim Hortons Contest Cup & Rules, PO Box 13293, Saint John, NB E2L 5E7, which must be postmarked by 4/17/16 and received by 4/27/16. Open only to residents of Canada and US/DC, except residents of RI, AZ, HI, FL, AK, PR. Void where prohibited. • millions of Coffee and Food Prizes (approx. odds at outset 1 in 6), ARV $0.70-$4.24 CDN each. Total ARV of all prizes is $63,341,199 CDN. There is also an online game (no purchase needed) called Roll Up Replay, click here to play that. Also check out the Tim Hortons Roll Up At Home Contest for even more ways to win! I have won two free coffees for myself and a friend. I think you think that you're talking to Tim Hortons here, but you aren't, this is a blog where I share offers. If you have a gripe with the contest, you need to contact Tim Hortons directly, I have nothing to do with it. I have won nothing yet? Winning more than "please play again" on line or with an actual cup would be nice! I won a $25 gift card on the online game. Yay! I won a free coffee on a roll up last night, I was thrilled to finally win something.